You can set up your own bouncer too! Last year’s The Perl Conference at Orlando was my first one. I had a lot of fun, met with brilliant people and learned numerous things about Perl. There was one thing that I didn’t expect: People actually use IRC! Wiki for YAPC 2016 has a page named Tips for First Timers which includes a note saying “Not All the Fun Happens in Meatspace”. Indeed, IRC serves as a perfect medium for people to communicate, comment (on talks), ask for help, and so on. If you are attending YAPC, and not reading #yapc, you are missing a lot. IRC stands for Internet Relay Chat.. and it’s been around since 1988! It lets people communicate in real time (think ancestor of Slack). There are channels like #yapc in servers like irc.perl.org. Wikipedia has a lot more details if you want to take a look. How do I get online now? The fastest way to do it would be to use a service like Mibbit. You only need to pick a nickname, and you are online! There are a ton of applications available. Take a look at last year’s wiki to find what’s best for you. 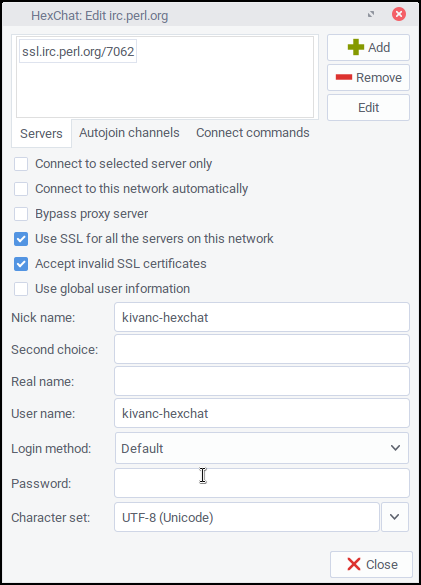 Make sure address is ssl.irc.perl.org/7062 (irc.perl.org/6667 works too), enable SSL, pick a nickname and leave password blank. That’s pretty much it! There’s a caveat though: You will be missing any messages sent when you are offline. So how do I stay online all the time? You need a bouncer. Think of it as a middle-man: Bouncer connects to irc.perl.org on behalf of you, then you connect to your bouncer through your IRC client. Since the bouncer is always connected, you won’t be missing any messages. There is a service for that too, called IRCCloud. It has a free plan which is good for a week, except you still have to login every two hours or so. They also have Android and iOS apps. How do I set up my own bouncer? Listen on port: This is tricky. If you are on a public wifi that blocks ports (could be the case for some conference venues) you need to make sure you pick a port that you have access to. Or you can use VPN to avoid that. 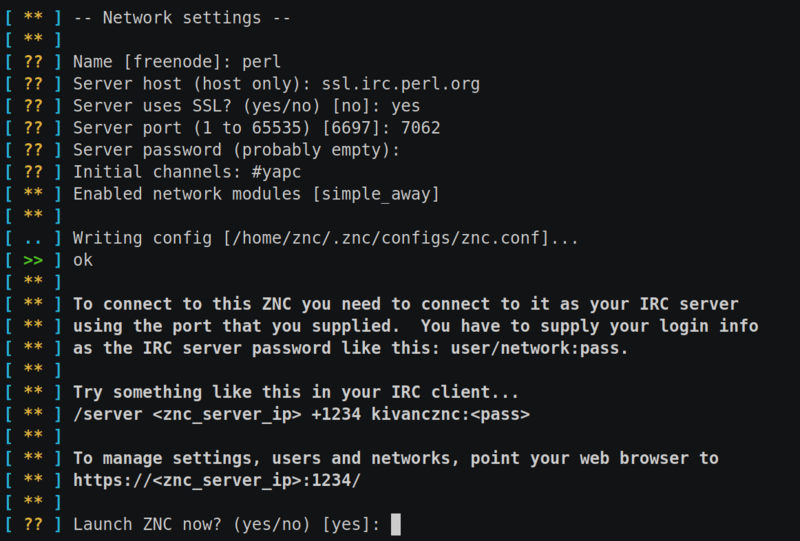 Once all is done, it will ask you whether you want to run znc now, which you can say yes. I also recommend setting a cronjob that restarts znc if it’s not running for some reason. If you want to see the admin panel, you can go to https://host:port. (port that znc listens to). 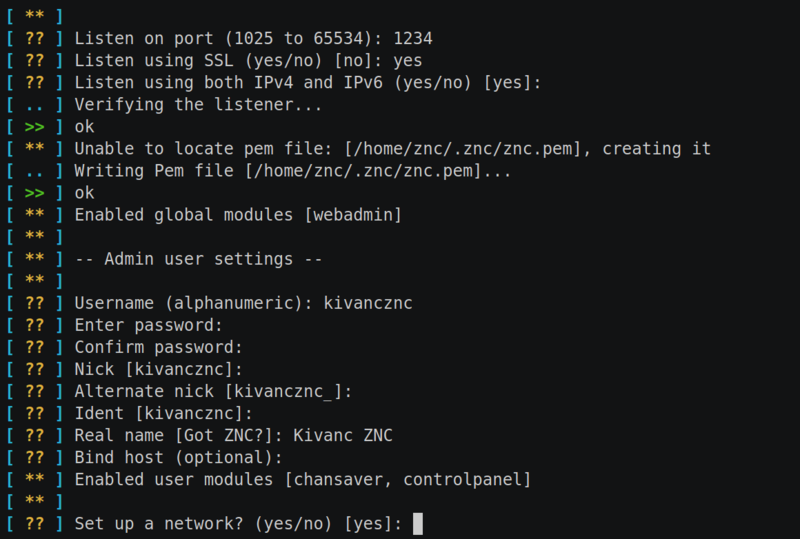 You can login with admin username & password you set during znc configuration setup. Only thing left is to set up your client just like before. 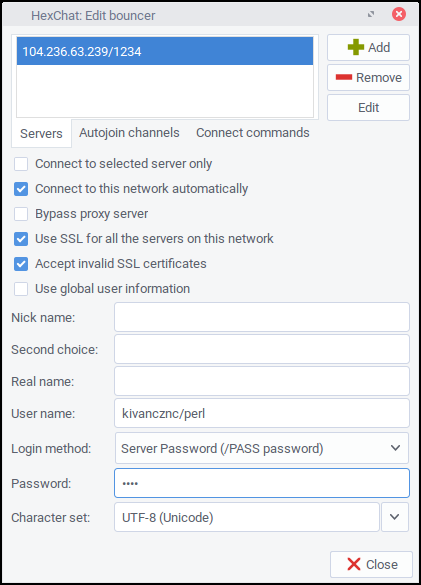 Login method is Server Password, and the password is admin password. That’s it! See you at #yapc!